Last weekend, I got to go to the Public Health Collaboration’s Annual Conference in London, a 2-day event I had been looking forward to for weeks. The PHC is a charity founded by Personal Trainer Sam Feltham just a few years back, and it is now backed and supported by numerous doctors – GPs as well as specialists – ‘Ambassadors’ (PHC volunteers) and members. What brings all those people together is the growing frustration with our existing health care – or ‘sick care’, as some prefer to call it – system, where the default option seems to be medication. Lifestyle factors for chronic disease, most notably nutrition, are rarely considered relevant, not as a possible contributor or even underlying cause for chronic illness, and not as a powerful remedy either. This is what the PHC and its supporters are looking to change. I wanted to go because there were a number of speakers on the list whose work I follow and I wanted to hear them speak in person, e.g. Dr Zoe Harcombe PhD, Dr Aseem Malhotra, Dr David Unwin, Dr Peter Brukner, and of course Prof Tim Noakes. There were also a number of expert speakers I had not heard of yet, but now I’m glad that I have and was there to hear what they had to say, such as diabetic endocrinologist Dr David Cavan and cardiologist Dr Scott Murray. I frequently go to seminars and conferences, not just because I have to for my Continuous Professional Development (CPD), but also because I love to learn and stay with the current science. Invariably on such occasions, I bump into people I know: other nutritional therapists, who like me, are looking to widen their knowledge base and stay on top of things. But that’s bound to happen when I walk into a lecture theatre with 300 nutritional therapists. This weekend’s conference was quite different and the audience consisted of people from all walks of life: interested members of the public, patients, health coaches, nutritionists, dieticians, nutritional therapists, GPs, cardiologists, gastro-enterologists and even some familiar faces such as Ivor Cummins, Michael Mosley and Patrick Holford. I didn’t bump into any colleagues there – or at least nobody I knew – but I got to speak to GPs, a nutritional therapy student, PHC volunteers, and patients. I was delighted to see so many doctors there, especially the ‘front line’: GPs. Those who were there are just as frustrated with our existing health care system as I am. They went into the profession to help people get better, but they find that they’re not very successful at it, despite their best efforts. all of them – either on or off stage – said that they had not received any training whatsoever in nutrition. What they now know is what they chose to learn after they left university, and many only in recent years. They expressed their frustration at the poor outcomes they achieved while advising patients to follow the official nutrition guidelines. On Saturday, Southport GP Dr David Unwin showed the audience the amazing results he has had in the treatment of diabetes – not with medication, but with diet and behaviour changes. His practice now saves about £40,000/year on diabetes medication and moved to the top of list of GP practices in England with regard to positive patient outcomes. A patient – not his – in the audience got up and told us about her experience. She had type 2 diabetes and said that while medications had somewhat managed her blood sugars, she never felt good. In fact, she had even forgotten what it was like to feel good. BUT as soon as she cut out processed foods, sugar and refined carbs she felt better the next day. This was her point: “When you cut out the crap, you feel better instantly. It’s a matter of hours, not days and months.” (I have seen that happen with my own clients.) She is now off all her meds. I saw many heads nod in agreement. Patients? Doctors? I don’t know. The man I sat next to the next day, who had been diagnosed with type 1 diabetes 40 years ago, confirmed the same thing: You begin to feel better immediately – something his meds never did for him. He, of course, has to inject insulin for the rest of his life, but he now needs only half as much as he used to. Many of the doctors on stage described their relief at ‘preaching to the converted’ for once. Because they have all changed their approaches, going against the grain, and some of them creating quite a lot of publicity (e.g. Aseem Malhotra – just watch his talk to the EU Parliament a few weeks ago: “Killing for Profit”), they are not necessarily welcomed with open arms, even – or particularly - among their peers. They get a lot of opposition, so I can imagine that it was nice not to have to worry about that for once and to have an appreciative, captive audience. 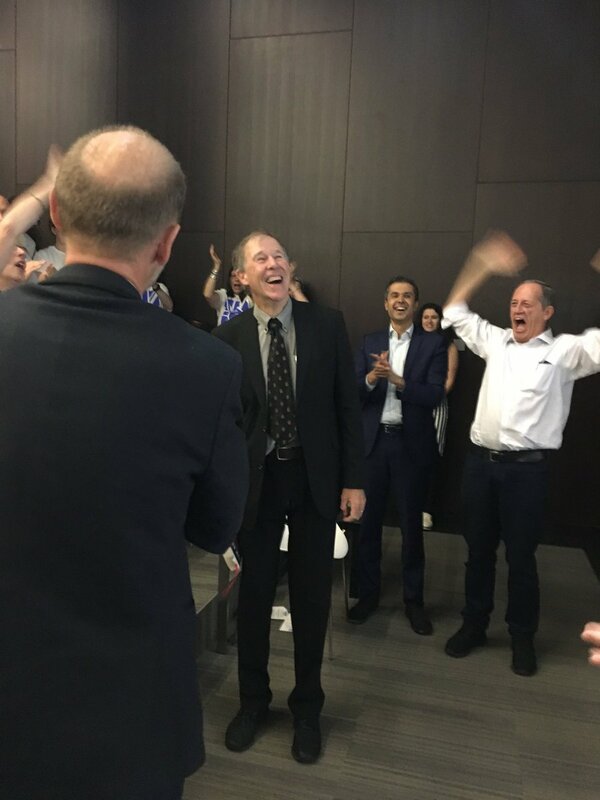 Undoubtedly one of the most memorable moments was a never-ending standing ovation for Prof. Tim Noakes after his presentation. There was hardly a dry eye in the room. A member of the audience – and indeed quite a few people on Twitter – thought it a bit much, verging on the ‘evangelical’. True, I can see how one would think that, but actually I think Prof. Noakes deserved it. It takes something for a respected, established scientist who is a leading figure in his field to make a public U-turn and tear up his own textbooks. He would have had to expect being laughed at (at best), losing his reputation, being ostracised by the scientific community, losing funding … he wouldn’t be the first who was right, but had to pay for it. And indeed he was charged for professional misconduct for a ridiculous reason. The real reason? It doesn’t take a genius to figure out that this is about his ‘heretic’ views on the official dietary guidelines. Tim Noakes could have had it easier. When diagnosed with type 2 diabetes and realising that he had been wrong, he could have just changed his own diet and kept quiet about it. Instead, he put his reputation on the line, shouting from the rooftops that he’d been wrong. No, I think he deserved his standing ovation. We need more scientists like him to stick their necks out, so, thank you, Prof Noakes. I don't know who took this photo - it's been doing the rounds on Twitter and I hope it's ok for me to use it here. I nicked it because it's such a great picture. If it's yours and you want me to remove it, please drop me a message!